A while ago Paul Stewart wrote a fantastic blog post listing the potential business benefits of SDN (as promoted by SDN evangelists and SDN-washing vendors). Unfortunately, the reality of IT in general and IPv6 in particular is a bit different. 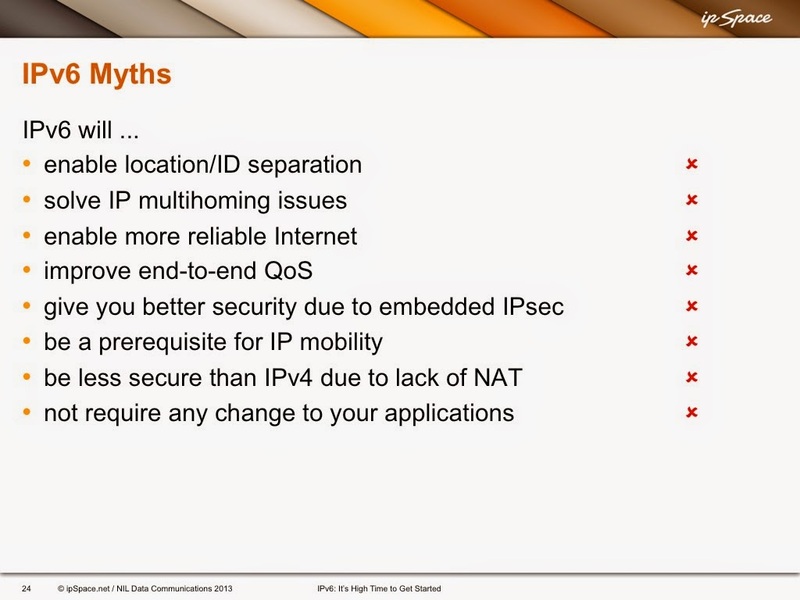 The overly hyped IPv6 benefits remain myths and legends; all we got were longer addresses, incompatible protocols (OSPFv3 anyone), and half-thought-out implementations (example: DNS autoconfiguration) ridden with religious wars (try to ask “why don’t we have first-hop router in DHCPv6” on any IPv6 mailing list ;). 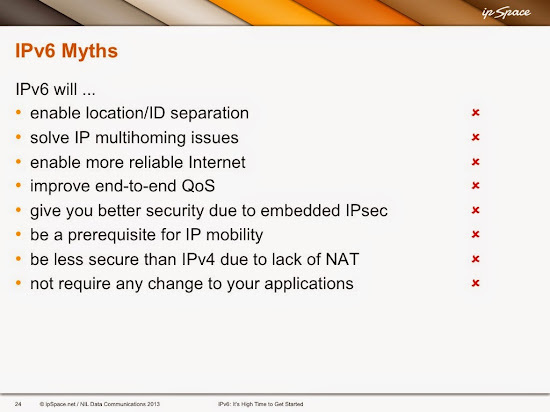 You might also want to watch the fantastically cynical presentation Enno Rey had @ Troopers 2014 IPv6 Security summit. For in-depth IPv6 details, visit my IPv6 resources page. That said, you could at least make the case the a lot more of the SDN bullet point have existing technologies you can buy today that implement them, such as Tail-f and Control for better orchestration or openflow for granular control. We're still a few years from figuring out how these bits and pieces will all plus together in a big picture, but there's a *lot* more room for incremental benefit in SDN than the giant monolith of IPv6. Well, the only point where I'd agree there's some meat today is "NFV and Service Chaining" and there's potential for "DevOps friendly architecture". One big difference, IPv6 is a standard whereas SDN is a concept. IPv6 also started as a concept and a grand unifying theory of everything ... and all that's left are a bunch of draft standards (it's not a single standard, and it's not, strictly speaking, a standard at all). Do you expect SDN to follow IPv6 way ?. People will keep taking about benefits of SDN but will take longer time to implement ? Great points. When I think about IPv6 and SDN, I certainly can see similarities. However, I believe there is potential for SDN concepts to be adopted more aggressively than the IPv6 protocol. When we think about SDN, businesses can realize the benefits immediately. Moreover, it can be implemented in constrained areas with connectivity to traditional networks through traditional mechanisms. When that is compared, IPv6 is another Internet protocol with additional overhead (technically and operationally). Admittedly, IPv6 needs to happen. Unfortunately, our lives just get a more complex. That complexity will lessen as IPv4 can be relegated. But that will be a long, long time.